Domestic cricket represents the depth of cricketing strength for any test playing nation. Bangladesh. being the newest member of the test family, is still at a developing phase in terms of domestic cricket. Bangladesh inherited a rich cricketing history as it was initially part of Bengal and then East Pakistan. Dhaka Stadium (Current BNS) hosted test matches during Pakistan era. After gaining independence it took a while to enter into the world cricketing arena. In 1976-77 an MCC side first toured Bangladesh which was followed by unofficial and official tours by different teams of test playing nations. Bangladesh gained associate membership of International Cricket Council (ICC) in 1976 and in 1979 first participated in the ICC trophy. In 1994-95 England became the first test playing nation to send A team to Bangladesh. Bangladesh enjoyed limited success in ICC trophy and against different touring teams yet cricket gained enormous popularity in Bangladesh. Bangladesh finally won 1997 ICC trophy and qualified for the 1999 World Cup for the first time. After a dream 1999 World Cup in which they defeated Pakistan, Bangladesh gained the test status in 2000. At the time of gaining test status there was no first class cricket league in Bangladesh. Prior to gaining test status, Bangladesh started a national cricket league involving 12 teams which was not a first class tournament. During that time, Dhaka Premier Cricket League which is a limited over tournament was the main cricket competition in the country. Cricket league was played in almost every district town but all were shorter version of the game. Bangladesh started its maiden first class competition under the name 'National Cricket League' involving six divisional teams (Dhaka, Chittagong, Rajshahi, Khulna, Barisal and Sylhet) Biman Bangladesh Airlines and Dhaka Metropolitan team from 2000-2001 session. A national one day (list A) league also started from the same season. From 2001-2002 season, National Cricket League involves six divisional teams. These six teams play each other home and away once in a league. The domestic cricket standard of Bangladesh is yet to reach the standard of test playing nations. Over the last five years Bangladesh made significant improvements in the domestic cricket infrastructure and cricketing standard. With current rate of progress it is expected that Bangladesh domestic cricket will reach its desired standard within 5-6 years. Bangladesh national team enjoyed a memorable year in 2006 and so did the domestic cricket. In 2006 Bangladesh got 4 international venues accredited by ICC, established first ever National Cricket Academy and entered into the newly built dedicated cricket facility termed as 'Home of Cricket' at Mirpur and finally received huge monetary boost to develop cricket infrastructure through the TV rights deal with nimbus. 2006 was an eventful year for Bangladesh cricket in the domestic arena. From a cricketing point of view, it is difficult to review Bangladesh cricket over a calender year because Bangladesh Domestic Season spans from October to April spanning two calender years. In this review, I tried to summarize all forms of domestic cricket that was played in 2006. The Dhaka based limited over competition (50 over) is one of the main attraction of domestic cricket. old DOHS emerged as the new force in the domestic competition from its first appearance in 2004-05 league in which they became Champion. The league started from 12 December 2005 and finished on 04 February 2006. In a bid to retain the trophy, old DOHS Sports Club made a very strong team blended with experienced player and promising youngsters. Veteran Akram Khan was the captain. The surprise package of the league was the new entrant Sonargaon Cricketers. The star studded team was led initially by Al Shahriar and then by Mohammad Ashraful. All national players featured in the league which increased the intensity of the competition. Notable foreign players were Tatenda Taibu (City Club), Steve Tikolo (old DOHS), Sandeep Sharma (Mohammedan), Zafar Qureshi (Victoria), Tariq Mahmood (kalabagan). Rashed Hanif (Brothers) and Sreedharan Sreeram (Sonargaon). old DOHS Sports Club, Sonargaon Cricketers, Biman Bangladesh Airlines, Mohammedan Sporting Club, Brothers Union and Victoria Sporting Club managed to make it to the super sixes. The notable absentee was Abahani Limited. After an intense competition old DOHS beat Biman Bangladesh Airlines in the penultimate match to retain the title. Sonargaon Cricketers came back strongly after a poor start and finished as runner up. Steve Tikolo of old DOHS was the leading run scorer with 867 runs with an impressive average of 57.8. The Premier League batting records were dominated by the foreign players with the exception of Al Shahriar (562, Sonargaon Cricketers), Nasiruddin Faruque (539, Victoria Sporting Club), Akram Khan (532, old DOHS Sports Club), Javed Omar (509, Biman Bangladesh Airlines), Manjarul Islam (485, old DOHS Sports Club) and Mohammad Ashraful (481, Sonargaon Cricketers). Ispahani Mirzapore Tea 7th National Cricket League was played in six different venues from 19 November 2005 to 23 March 2006. The first leg of the National Cricket League 2006-07 held from 9 November 2006 to 9 December 2006. National selectors declared squads for the divisional teams on November 4. There were few changes for each division from their previous squad for NCL 2005-06 due to emergence of some young cricketers in the national fold. It will again resume in February 2007 after completion of Premier Division Cricket League. Squad : Naeem Islam, Zahirul Islam, Hasanuzzaman, Farhad Hossain, Anisur Rahman, Mushfiqur Rahman, Rezaul Islam, Zunaid Siddeque, Shafaq Al-Jaber, Mohammad Shahajada, Alamgir Kabir, Sumon Saha, Sohrawardi Shuvo, Arif Hossain, Arif Reza, Mohammad Nirala, Mahbub Alam Mustaquim, Rafiqul Islam, Khaled Mashud, Forhad Reza and Mushfiqur Rahim. Coach: Wahidul Gani. With youngsters contributing Rajshai is well placed after first leg to retain the title. Rajshahi won 3 out of five matches with the two draws came against Khulna in the rain-affected opening round and in the title challenging clash with Dhaka. In case of batting, Naeem Islam is as consistent as previous NCL and is showing his worth, Jahurul Islam continues to impress, and Junaid Siddique batted tremendously well against Khulna with a superb unbeaten hundred to ensure victory. National players from Rajshahi has not yet performed as per expectation, neither Farhad Reza nor Mushfiqur Rahim had a poor run in the first round. Mohammad Shahzada has been the undisputed star of the league so far, while Suhrawadi Shuyvo has provided useful support with his slow-left arm. Leading run scorer: Naeem Islam (306 runs @ 43.71, 2x50, 1x100), Jahurul Islam (269 runs @89.66, 2x100), Junaid Siddique (252 runs @ 84.00, 1x100, 1x50). Leading wicket taker: Mohammad Shahzada (31 wickets @ 14.03, 2x5i, 1x10m), Suhrawadi Shuvo (15 wickets @ 13.26, 2x5i), Mushfiqur Rahman (13 wickets @ 25.84, 1x5i). Squad : Al Shahriar, Uttam Kumar, Nadif Chowdhury, Marshal Ayub, Shamsur Rahman, Arafat Sunny, Sajjad Kabir, Mahmudullah Riyad, Mosharaf Hossain, Mohammad Sharif, Talha Jubair, Mohammad Azam, Anwar Hossain Monir, Mohammad Shakil, Zabid Hossain, Javed Omar, Mohammad Ashraful, Mohammad Rafique, Mehrab Hossain Jr, Shahadat Hossain, Anwar Hossain, Rezaul Islam, Mahbubul Alam. Coach: Sarwar Imran. This year Dhaka is blessed with two brilliant innings from Mohammad Ashraful including 263 against Chittagong which helped them picking early wins. But they could not maintain their form and slumped to defeat against Sylhet in the last round. Their two wins came against Barisal and Chittagong. Masrhall Ayub is showing his brilliance and is a future for Bangladesh cricket. Another SLA Mosharraf Hossain is taking big wickets and Dhaka is well balanced when they are not getting the service of Mohammad Rafiq. Leading run scorer: Mohammad Ashraful (417 runs @ 83.40, 2x100), Marshall Ayub (353 runs @ 44.12, 1x100, 1x50). Leading wicket taker: Mohammad Sharif (24 wickets @ 19.70, 2x5i, 1x10m), Mosharraf Hossain (20 wickets @ 19.90, 1x5i), Mohammad Rafique (10 wickets @ 14.6). Squad : Ehsanul Haque, Tamim Iqbal, Nazimuddin, Gazi Salahudiin, Faisal Hossain, Sabbir Khan, Dhiman Ghosh, Nadimuddin Mintu, Tareq Aziz Khan, Gazi Alamgir, Kamrul Islam, Ilias Sunny, Sadid Khan, Ashiqur Rahman, Nafis Iqbal, Aftab Ahmed, Debbroto Paul, Saju Dutta, Raihanuddin Arafat and Mahmudul Hassan. Coach: Minhazul Abedin. Chittagong made a quiet start in the current NCL. They were frustrated in couple of occasions by weather and once by the mighty innings of 263 by Mohammad Ashraful. From a comfortable position against Barisal when they were 68/5, Arafat Salahuddin and Shahin Hossain batted out the day to frustrate them. Gazi Salahuddin is continuing his run feast and young Tamim Iqbal is showing some signs of consistency. Bowling is indifferent and that's why they failed to win a single match. Sabbir Khan is the work horse for them and taking wickets. Leading run scorer : Gazi Salahuddin (384 runs @ 42.66, 1x100, 2x50), Faisal Hossain (311 runs @ 44.62, 1x100, 1x50), Tamim Iqbal (286 runs @ 31.77, 3x50), Ehsanul Haque (278 runs @ 30.88, 1x100, 1x50). Leading wicket taker : Shabbir Khan (29 wickets @ 22.55, 3x5i, 1x10m), Tareq Aziz (13 wickets @ 35.53). Squad :Golam Rahman, Imtiaz Hossain, Ejaj Ahmed, Alok Kapali, Golam Mowla, Golam Mabud, Sirajullah Khadem, Mohammad Rana, Ahmed Saqiqur Rahman, Rezaul Haque, Hasibul Hossain, Zakwan Ahmed, Enamul Haque (Jr.), Nazmul Hossain, Nabil Samad, Saif Mahmud, Moniruzzaman, Mitun Ali, Rajin Saleh and Tapash Baisya. Coach: Golam Faruk Suru. Sylhet started the season with two consecutive draws against Chittagong but failed to cope with Impressive Mohmmad Shahjada against Rajshahi and conceded the match. In the next round sylhet earned their solitary but memorable win against Dhaka with a team performance. Thanks to centuries for Rajin Saleh and Alok Kapali and wickets from very impressive looking Nabil Samad. Rajin Saleh and Alok Kapali are scoring runs to regain their place in the national side while young Imtiaz Hossain is showing some promise. This year Sylhet i witnessing the revolution of Tapash Baisya as an all-rounder. Leading run scorer : Rajin Saleh (334 runs @ 47.71, 1x100, 2x50), Golam Mabud (322 runs @ 35.77, 1x100, 2x50), Imtiaz Hossain (318 runs @ 31.80, 1x50), Alok Kapali (298 runs @ 33.11, 1x100). Leading wicket taker : Nabil Samad (17 wickets @ 20.70, 2x5i), Hasibul Hossain (12 wickets @ 32.83), Alok Kapali (11wickets @ 28.81). Squad : Nazmus Sadat, Sajjadul Hasan, Salauddin Ujjal, Shafiul Alam, Mohammad Selim, Sahgir Hossain, Jamal Uddin, Ziaur Rahman, Dollar Mahmud, Shiplu, Monjurul Islam, Mazhar Uddin, Asadullah Khan, Humayun Kabir, Fahim Muntasir, Sadiq Khan, Nasir Hossain, Manjarul Islam Rana, Tushar Imran, Habibul Bashar, Mashrafee Bin Mortuza, Sakib Al Hasan, Abdur Razzak and Syed Rasel. Coach: Abdul Hadi Ratan. Khulna is yet to register a win in curent season. National discard and Captain Manjarul Islam Rana is talking with both bat and ball and is the leading run scorer of current NCL. He is well supported by opener Sajjadul Hasan with bat and young Dolar Mahmud with ball. Nazmus Sadat has failed to continue his run feast from previous season which is adding further misery to Khulna. Leading run scorer : Manjurul Islam Rana (421 runs @ 60.14, 2x100), Sajjadul Hasan (342 runs @ 42.75, 3x50). Leading wicket taker : Manjurul Islam Rana (15 wickets @ 17.80, 1x5i), Dolar Mahmud (14 wickets @ 16.50, 1x5i), Ziaur Rahman (12 wickets @ 24.00), Sadik Khan (10 wickets @ 24.60). Squad : Hannan Sarkar, Imran Ahmed, Nasir Uddin Faruque, Rakibul Hasan, Humayun Kabir, Arman Hossain, Mehdi Hasan, Mohammad Shafen, Ishraq Sonet, Abul Bashar, Sajidul Islam, Arafat Salauddin, Ali Arman, Ahsanullah Hasan, Ariful Haq, Mokhtar Ali, Taposh Ghosh, Lablu Rahman and Shahriar Nafees. Coach: Md. Emdadul Haque. Barisal is undoubtedly the weakest side of the tournament. Their high point came when they defeated relatively strong Khulna in Dhanmondi Cricket Stadium. Good Allround performance by Ali Arman and solid batting by Arafat Salahuddin ensured the solitary win. Barisal will be fighting this year to avoid the last place. Leading run scorer : Arafat Salahuddin (353 runs @ 44.12, 1x100, 2x50). Leading wicket taker : Ali Arman (17 wickets @ 19.29, 1x5i), Sajidul Islam (16 wickets @ 21.68, 1x5i), Ishraq Sonet (11 wickets @ 26.36), Arafat Salahuddin (11 wickets @ 32.81). Grameen Phone Corporate Cricket League started on 7th October after a series of delay and uncertainicty due to mismanagement from BCB. After losts of hue and cry finally twelve teams played in two groups. Teams are, Group A: Beximco Group, Syfang Fan, Channel F2 Advertising, StarTel, Acme Laboratories and Chittagong Port Authority and Group B: Epyllion Group, Asia Pacific Blossom Hotel, MM Ispahani, Raju Fish Culture, Bangladesh Biman and Partex Group. Due to lack of interest of corporate houses to make quality teams, players suffered in the transfer market which raised eye brows about the future of this league. Defending Champion Beximco Group, Acme Laboratories, Epyllion Group and Partex Group made it to the semifinal. Beximco group signed Kumar Sanggakkara for the semifinal and final. In the first semifinal Acme Laboratories eased past Epyllion group by seven wickets. Epyllion Group posted a modest 206 mainly relying on a defiant 88 from Captain Tushar Imran. Sandeep Sharma of Acme took 3 wickets for 16 runs. In reply, Acme reached the target with more than six overs to spare. Couple of fifties from Hannan Sarkar (55) and Habibul Bashar (54*) helped them to reach the target. Second semifinal witnessed another one sided affair when Beximco Group defeated Partex Group by 61 runs. batting first Beximco posted a competitive 252 runs, thanks to a masterful 69 from Kumar Sanggakkara. In reply Partex Group never posed any challenge to the total. A patient 68 from Captain Khaled Mashud only reduced the margin of defeat. The final was a crunch one in which Acme Laboratories came with an early surprise by signing Srilnakan legend Santh Jayasurya. In the thrilling final Acme Laboratories won the toss and decided to bat first. Acme posted competitive 235 runs. National duo Habibul Bashar (68) and Aftab Ahmed (55) continued good form. Star signing Sanath Jayasurya failed with bat and only scored 14. Nazmul Hasan rattled through the tail and ended with 5/52. In reply Beximco was soon reduced to 109/6 but a responsible second fifty by Srilankan Kumar Sangakkara returned them into the match. A 46 run partnership beteween Mashrafee Mortaza and Abdur Razzak game them the title hope but Acme Laboratories enjoyed the last laugh and the title for the first time. Beximco fell short of just 3 runs. Throughout the Corporate Cricket League national players showed impressive form with both bat and ball. Young Nadif Chowdhury and Marshall Ayub showed impressive form which resulted in national call up for Nadif Chowdhury. Bangladesh entered into the era of twenty20 cricket with the first ever Premier League Twenty20 league. Kai Altech group sponsored the inaugural tournament to become a part of history. The tournament experienced some hiccup in the beginning due to political unrest and poor quality of white balls. Apart from that the tournament was a huge success as it was full of high profile matches and intense compteitons. Players enjoyed the new form of cricket and returned with impressive figures. The league have drawn more attention due to the participation of national players. Twelve premier league teams played in two groups. The groups were Group A - Old DOHS Sports Club, Victoria Sporting Club, Biman Bangladesh Airlines, City Club, Kalabagan KC, Partex SC and Group B - Mohammedan Sporting Club, Abahani Limited, Sonargaon Cricketers, Brothers Union, Indira Road KC and Young Pegasus. old DOHS Sports Club, Mohammedan Sporting Club, Sonargaon Cricketers and Victoria were title contenders right from the beginning. After a scintillating group phase Mohammedan Sporting Club, old DOHS Sports Club, Abahani Limited and Victoria Sporting Club made it to the semi final. Group match between Mohammedan Sporting Club and Sonargaon Cricketers was the best match of the tournament. 19 yeras old Junaid Siddique played the best inning of the tournament to deny Sonargaon. Mohammad Ashraful's blistery 104 of 47 balls proved inadeqaute. The semi finals were played in the fast bouncy wickets of Mirpur national Stadium. The wicket tested batsmen from all four sides. The lusty batting of the group sound was almost absent in the semifinal and final. In the first semifinal old DOHS faced Abahani Lmited. Batting first Abahani posted a paltry 74, former national captain Khaled Mahmud caused the havoc by taking 4 wickets for only 17 runs. In reply old DOHS wobbled in the middle but finally reached home by losing five wickets. Mohammedan faced Victoria Sporting Club in the second semifinal. Mohammedan easily crushed victoria by 7 wickets. Victoria made 116 in 20 overs, Nasiruddin faruque chipped in 41 runs. In reply Mohammedan reached the target by losing only 3 wickets. Aftab Ahmed blasted an unbeaten 57. Everyone expected a crunch final match but it was a easy win for Mohammedan Sporting Club to clinch the title of first ever Twenty20 Premier League. Batting first Mohmmedan made an impressive start when their two young openeres Junaid Siddique and Imtiaz Hossain piled 134 runs in just 12.3 overs. After their departure Mohammedan lost their way and finally posted 184/5. old DOHS started their reply in similar fashion with their openers Tamim Iqbal and Mehrab Jnr chipped in for 46 and 33 runs respectively. But after they were out, old DOHS never came close to win the match and finally lost by 24 runs. A good amount of cricket is played in domestic circuit of Bangladesh. Apart from the top fights following competitions have impacts among fans and cricket board. 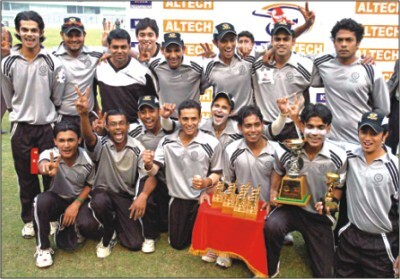 In National Cricket Championship 2006 (NCC) the breeding ground of young cricketers BKSP clinched the title by defeating Dhaka by a massive 104 run in their home ground. Partex Sporting Club became Champion of the First Division Cricket League 2005-2006 while young Pegasus ended up as runner up. Both the team were promoted to the Premier League from 2006-07 season. In the final league match Partex set a domestic record for highest ODI total when they posted a mammoth 400 runs in the stipulated 50 overs. After three years silence, National U-19 Cricket Championship resumed this year.Sixty-one district teams took part in the 23rd edition of the championship which was sponsored by Dhaka Bank. The matches were played in 10 different zones. Khulna District U-19 team beacme champion of the tournament by defeating Rajshahi U-19 cricket team in a two day final. Standard Chartered Young Tigers National School Cricket Tournament is one of the major tournament to nourish youngsters throughout Bangladesh. Previously known as Nirman School Cricket Tournament, it is one of the major success in the domestic circuit and a good number of national players started playing cricket from this tournament. Parjoar Kalindi High School emerged as Dhaka zone champions of the Standard Chartered Young Tigers National School Cricket Tournament defeating BKSP by 44 runs. 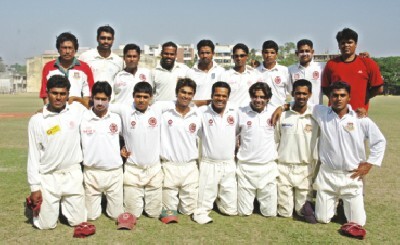 BKSP took the revenge in the national final when they defeated kalindi High School by 5 wickets to become Champion of the 2006 edition. Bangladesh Cricket Board worked hard throughout 2006 to get ICC approval of newly built grounds dediated for cricket. In 2006 ICC recognized 4 new international venues of Bangladesh. Mirpur Sher E Bangla Stradium is currently treated as the home of Bangladesh cricket. It includes dedicated indoor practice facility, gym and other dedicated cricketing facilities. For detail about Mirpur Stadium, please have a look at the following article A BanglaCricket Exclusive: The Mirpur Stadium . The wickets of this ground is quite unnatural compared to Bangladeshi standard. The central wickets are prepared according to Australian prescription and taking wickets of WACA of Perth as model. In recent Zimbabwe series, the wickets showed its fast and bouncy nature. As top domestic leagues will be played at Mirpur Stadium, it will add valuable experience to local players. Inclusion of Mirpur Stadium into the list of international venues and its cricketing facilities is the most significant addition to domestic infrastructure. Bangladesh domestic cricket made some significant progress in 2006 but its is yet no way near the international standard. The national team's performance largely depends on the standard of cricket played in domestic circuit. The gap between international standard and Bangladeshi domestic standard is reducing but not in desired rate. One of the major constraint is the lack of infrastructure. Apart from Cricket facilities of divisional cities and Bogra, other cities are quite neglected and requires huge development task. Another major setback is the lack of professionalism in the first class structure. The amount of money paid to each players of the divisional team is unacceptable to its last limit. Professional structure and economic solvency of the players is the pivotal factor for development of a quality first class structure. Lack of cricketing activities and related fitness program in off season (May – September) is another major concern. Indoor cricket facilities need to be built at least in divisional first class venues to solve the problem. Many cricket pundits raise concern about the wickets in which the domestic cricket is played. The quality of wicket has to be improved. Some prescribes for fast bouncy wickets for domestic first class tournament. I am not fully in line with their views. Bangladesh has its own unique condition and we need to exploit that. It is important to make good quality wickets which lasts for four days and behave consistently compared to current wickets in some venues which are under prepared or gives unequal bounce. To accustom with fast bouncy conditions, it is more important to arrange more A team and Academy team tours in countries like Australia, New Zealand and South Africa. BCB must act in a proactive fashion about these arrangements. Now, among these bad scenarios there are some good news and developments for the well wishers and fans of Bangladesh cricket. • Bangladesh Cricket Board for the firstr time has set up A National Cricket Academy which will take its full shape within couple of years. BCB Academy played some home tour matches and made a successful away tour with their Pakistani Counterpart. • BCB is setting up indoor facilities in six divisional first class venues which will be implemented within next five years. • BCB signed a six year TV rights deal with Nimbus which worth $57 Million. This huge money boost will help in developing domestic cricket infra structure. One of the main clause of the deal includes ’10 day telecast of domestic cricket’ which will boost interest in domestic cricket. • BCB has already set up Mirpur Sher E Bangla Stadium as new ‘Home of Cricket’. The project is not yet fully implemented, after full implementation it will be an unique addition to domestic facility. • BCB has appointed six pitch curators for first class venues who will team up with previously appointed development managers. These curators will also look after the wickets of the district venues. • In addition to existing sponsors, new sponsors (Kai Group, Epyllion, Dhaka Bank) are coming forward to sponsor domestic cricket. This is further enhancing financial solvency of Cricket Board. • A number of initiatives were taken in 2006 to find out cricketing talent from different corners of the country. These include ‘Grameen Phone Talent Hunt’, ‘Pink City Cricket Medhar Khoje’. BCB organized Pace Bowling camps for players selected for these talent hunt programs. • BCB is handling age group cricket a very professional way. Now regular age group tournaments are organized which includes U-13, U-15, U-17 and U-19 tournaments. • BCB is sending promising toungsters to renowned overseas academies like MRF pace academy in India, Commonwealth Bank Academy in Australia, Northern Territory Academy of Sports in Darwin, Australia. After getting trained, they are injecting their valuable experience into the domestic circuit. Now, these steps will definitely help Bangladesh Domestic Cricket to progress in right direction. By taking these initiatives in 2006, Bangladesh Domestic Cricket has taken a definite step for its transformation from Toddlers to Early Teens. It’s very important to continue these initiatives and take new effective plans for a complete transformation into world standard domestic cricket. Finally, it is quite safe to predict that with international success and domestic good works in 2006, Bangladesh Cricket is definitely heading towards a strong position in world arena. Last edited by Miraz; January 9, 2007 at 07:37 AM..
Last edited by Miraz; January 9, 2007 at 05:56 PM..
javed omar - avg 94.00. bradmanesque, eh? nice piece so far. i wonder if ehsan will play first class cricket all his life. the last time i watched him bat, he looked pretty ordinary, and his bowling looked easier than chacha's. looks like he's come a long way since. what's with shanto? the bowling version of tushar imran? I have basically worked with the stats part of the article. Also the A team tours, Academy team, BCB and age group is left I(Although, I have already written the major part in MsWord, will copy paste later ). You may find this DS report helpful. Top 10 batsmen: Steve Tikolo (867 runs, DOHS), Rashed Hanif (696, Brothers), Sandeep Sharma (615, Mohammedan), Al Shahriar (562, Sonargaon), Nasiruddin Faruque (539, Victoria), Akram Khan (532, DOHS), Jaffar Quraishi (530, Victoria), Javed Omar (509, Biman), Manjarul Islam (485, DOHS) and Mohammad Ashraful (481, Sonargaon). Top 10 bowlers: Abdur Razzak (40 wickets, DOHS), Jaffar Quraishi (32, Victoria), Mosharraf Hossain (28, Biman), Waskurni Palash (28, Victoria), Mohammed Rafique (27, Sonargaon), Tapash Baisya (27, Sonargaon), Arafat Sunny (24, Brothers), Mohammed Sharif (24, Brothers), Mahbubul Alam (23, Sonargaon) and Sabbir Khan (21, Mohammedan). Wow, Miraz bhai, your articles are always so in-depth. Just how do you find the time, or even the patience? No wonder he is doing a PHD !!! The time and patience that goes in research is a pain in my back side. But kudos to Miraz bhai. He has the knack for research it seems. In this regard we are poles apart. Massive work Miraza, and you still have not covered CCL and Twenty20 league ! Care to add few lines about the StanChat school league, U/19 domestic league, and national champinship ? Incase you have not noticed, national championship is basically an oneday league for district teams (though it includes teams from BKSP and DU) where teams are made of players who have not got their break through into NCL or DPL yet. BKSP was last year's champion while Dhaka was the runners up. Khulna was last year's U/19 league champion beating Rajshahi in the final. Lots of hard work, Miraz. This shows your love for Bangladesh cricket. One day we will do it, bro. Miraz: This is a gold mine of info. Many many thanks. Great piece of work, man. Highly informative. Thanks Miraj vai. Miraz bhai, thanks for the inspiration. Another great work Miraz, thanks man. After a dream 199 World Cup in which they defeated Pakistan, Bangladesh gained the test status in 2000. Miraz bhai really has a taste for stats, not to mention such patience! Keep up the great work, can't wait to read the finished review. TheWatcher, thanks for the info. I am aware of NCC and school cricket and U/19 domestic league. Its impossible to cover every single tournament. I will try to cover all of them in a single paragraph. I am concentrating on the highest level of domestic cricket. Almost completed the domestic review. Will add a paragraph about BCB and Home of cricket, correct some mistakes, check stats and add some pictures of youngsters performing in domestic circuit. Decided to exclude Bangladesh A, Age Group and Academy team from the domestic review as they do not solely belong to doemstic circuit (home and away tour, U-19 world cup and Academy Team Pakistan tour). Planning to write a separate review about these pipelines of National Cricket Team in near future. I am requesting everyone to have a look at the review. Its really really a hard work. Can anyone provide me the pictures and seating capacity of newly recognized grounds? Ok .. after some thinking, I decided to add a section to BC on our cricket stadiums. It will be a menu item under tours. Good work Miraz bhai. You have got the time and patience!